The California Air Resources Board has announced support for a proposal that would block the increasing use of Alberta tar sands and other extra-polluting crude oil at the Bay Area's five major oil refineries. This proposed Bay Area Air Quality Management District limits, known as Rule 12-16, would likely make the Bay Area the first place in the world to limit oil refineries' overall pollution levels. It would enforce caps on the refineries' greenhouse gas and particulate matter emissions, based on July 2016 levels. 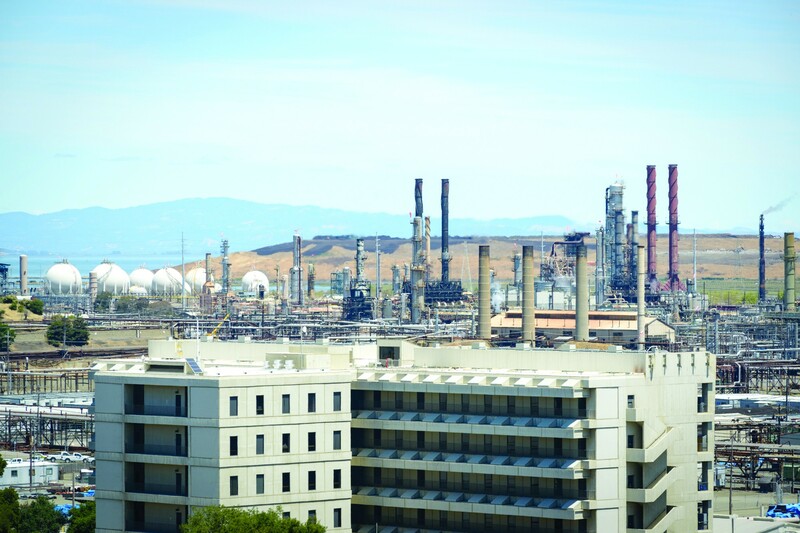 In an April 5th letter, CARB Executive Officer Richard Corey informed BAAQMD Executive Officer Jack Broadbent that the state agency “support(s) the intent” of Rule 12-16 and two other Bay Area proposals to address oil refinery pollution. The letter marks a major breakthrough for community, labor, and environmental groups that have been advocating the caps. Staff members with the BAAQMD, whose board of directors will vote on the proposal soon, have opposed Rule 12-16, partly on the grounds that it would interfere with California’s effort to combat climate change through its cap-and-trade pollution-trading program. The letter from CARB, which administers the cap-and-trade program, knocks down that objection. Corey's letter also supports two additional proposals, one that would require an assessment of health risks and plan to reduce pollution at all industrial sites, and another that would cap the per-barrel emissions of pollutants from oil refineries. As the Express previously reported, the letter was a subject of intense speculation before anyone at BAAQMD had seen it. Oil processing is already California’s largest industrial emitter of greenhouse gases, worse than power generation. The state’s refineries have developed a greater technical capacity to convert lower-quality, denser oil into engine fuels than those in other parts of North America. For this reasons, the oil industry views the Bay Area’s refineries as ideal sites to process the tar sands. A full-blown switch to tar sands processing would increase California oil refineries' pollution by 40 to 100 percent, according to research by Communities for a Better Environment (CBE) Senior Scientist Greg Karras. Recent tar sands-oriented proposals by Bay Area refineries include 100-car oil trains and new processing units. In the past ten months, Chevron, Phillips 66, Tesoro, and Shell have intensively lobbied BAAQMD against emissions caps, with local refinery managers testifying that the rule would lead to a loss of jobs. CBE's Karras points out that the proposed caps still set pollution limits at seven percent higher than the highest levels of pollution in the past five years. The proposed rule, he says, “doesn’t require anyone to do anything different.” Nevertheless, he notes, they would accomplish something unprecedented: They would effectively bar the major oil refineries in the Bay Area from processing the portion of the world’s oil reserves that poses the greatest threat to the global climate. It’s an idea that could spread to other refinery regions, including those in Los Angeles and Washington State, proponents say. According to Karras, the CARB letter itself even has significance beyond its impact on Bay Area. It clearly rejects “the concept that pollution trading will solve the problem of greenhouse gas emissions, and that therefore we should not allow any other policy to get in the way,” he says.